Earlier this year, I started taking one year old compost from my compost bin, to carpet the beds in my greenhouse ready for growing luscious, more or less organic tomatoes, courgettes, sweet peppers, chillies, and various veg seedlings. Imagine my surprise, when, amongst the rich brown well rotted compost I found a pristine white carrier bag, in mint condition apart from a little superficial dirt, carrying the following message, in dainty green print: “This bag is fully BIODEGRADABLE and 100% COMPOSTABLE”. I don’t mind saying that I was miffed! I felt that I had been deceived – sold a pup – conned. My next stop was to Trading Standards – their office is not far away. They expressed their interest and promised to follow it up – and I’m sure they will, although who knows when?! Then, still simmering with the resentment of the deceived, I emailed the Radio 4 programme ‘You and Yours’. I also contacted my son who is knowledgeable about such things, and has useful contacts. You have no idea how interesting and complicated this subject becomes! Apart from all the rules which define what temperature and under what circumstances various degradable plastic products should actually degrade, there is the question as to whether it is a good idea to produce degradable plastic containment at all. Why would anyone prefer to use a bag which claims to be biodegradable? I suppose because they believe it is a more ‘environmentally friendly’ than the other kind. This was a point for very brief discussion when the ‘You and Yours’ presenter interviewed me this morning. So what would someone do with such a bag when it has outlived its usefulness? I guess that they would either put it in their compost bin, as I did, or put it in their household rubbish, probably to go to landfill, where it would safely degrade and feed the worms. Or perhaps they would put it into one of those bag recycling banks that some supermarkets have. 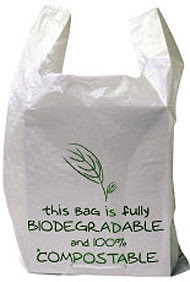 If a biodegradable bag finds its way into the bag recycling process, the fact that it is biodegradable is likely to adversely affect the quality of the recycled material. If the same bag gets into a landfill site, it will degrade, and in the process, most of its bulk will convert to greenhouse gas, some of which may be captured, in a well-run site, but most of which will go to atmosphere. The argument goes that a non biodegradable bag in landfill will do less damage to the atmosphere, because the carbon content is sequestered below ground for the foreseeable future, causing no damage to the atmosphere! To summarise – we, the public, are only confused by this type of marketing, and we achieve no environmental benefit. The myths promoted by people jumping on the green-agenda bandwagon are simply a marketing tool in the same category as those used by double glazing salesmen to promote the benefits of their products. But our dilemma is not resolved here! If I am to believe my movie viewing, in America the supermarkets give out paper sacks to hold the groceries. Surely that is more environmentally friendly? I just don’t know! I have just watched a Youtube trailer which shows huge old trees in ancient forest in Tasmania being blasted out of the ground to be converted to woodchips for conversion to pulp for paper, thus ‘liberating’ immense tonnages of carbon to add to our climate change problems. I believe that the process of making paper on a commercial scale is not an environmentally friendly business either, using as it does various chemicals, and no doubt copious amounts of power. When we see someone’s beautifully oiled teak garden furniture, we may be inclined to wonder what kind of sustainable source produced the timber. But when we collect our mushrooms into a supermarket-supplied paper bag, do we wonder about the environmental impact of the paper? The fact is that most of us don’t have a clue about what damage the goods we buy do to our planet. There is a partial solution, at an individual level, and it is this. Wake up on a fine sunny spring morning, have a good stretch, and resolve to unburden yourselves from all that messy desire to buy, to own, to possess for the sake of it. Try not to buy anything unless you are happy with the way it will eventually be disposed of. Don’t believe the ‘authorities’ which claim that electrical goods are being safely recycled – it often isn’t happening! If a manufacturer doesn’t know how his product can be safely disposed of – he shouldn’t be making it. If a shopper doesn’t know how his purchase can be safely disposed of at the end of its life, he shouldn’t be buying it. Reduce, Repair, Reuse, Recycle – aim for ZERO WASTE!! Thanks for posting this important info. I often wonder whether or not those biodegradable bags do actually biodegrade and it's obvious that not all of them do. Back in the day Safeway supermarket (RIP) used to provide large paper bags, like the American ones, but changed them for plastic carriers. Homebase did the same. The only real answer to the bag issue is to use a fabric bag, a trend that's catching on here in recent years, but absolutely normal practice in many countries outside the 'western' world. We are spoiled in this country, we've got used to a commercialised throwaway world where you replace rather than repair, not knowing the difference between need and want..... stop me, I could start a rant! I'm sure we could both rant dor Britain! I remember every Saturday morning, my Father used to go to town to do the weekly shopping, carrying a very similar bundle of shopping bags to the one I now carry - multicoloured, a bit tatty but eminently practical! Don't know exactly when, or why, we started using those plastic monstrosities!